The Chaser 48' was built locally by Island Boat Works with the traditional Carolina flare. The generator powers the A/C units keeping the spacious salon cool and comfortable. Fully equipped with the finest tackle available including Shimano, Tiagra, and Penn International reels on custom rods from light tackle to 120 lb. She cruises comfortably at 26 knots with NEW twin diesel CAT C-9 engines enabling a quick trip to the Gulf stream, and your fish. 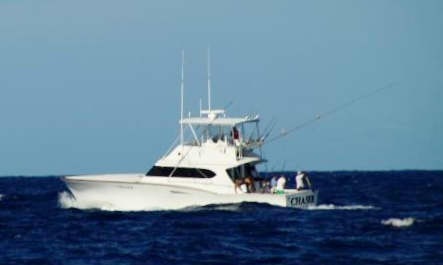 Excellent year round fishing: bluemarlin, sail fish, dolphin, yellowfin tuna, giant bluefin tuna, blackfin tuna, wahoo, king mackerel, red drum, striped bass, barracuda, amberjack, and other species.